Safaris. I’ve been lucky enough to do two before. I’ve seen the lions in the distance, the head of the giraffe just peaking over the trees and enough Impala (basically deer) to have me dreaming of them when I return to my contemporary, luxury hotel with 17 restaurants all serving varieties of the animals that we viewed from afar. The problem is? Well, it’s not really safari is it? It’s not exactly Indiana Jones when you’re looking at zoomed in photos from your 1,500 thread count sheets while watching Keeping Up With The Kardashians and eating a gluten free club sandwich from room service. No self-respecting Jumanji fan (Holler) would be satisfied with the mere peak of an elephants ear from the roadside. Vriende (“Friends” in Afrikaans) You. Don’t. Have. To. 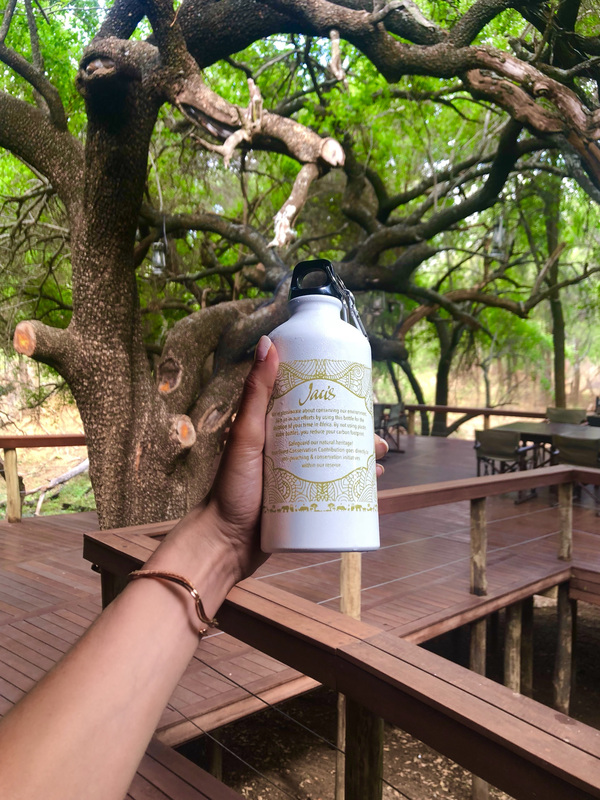 I am now writing to you as Jumanji Jane, a newly qualified (not at all qualified) lion wrangler (watcher from a safe distance) and I introduce to you my new soul-food, Jaci’s Lodges in Madikwe. This place is wow. Wow in the most rustic luxury way. Wow in the treehouse of my dreams way. They have two sides; Jaci’s Tree Lodge and Jaci’s Safari Lodge. I was lucky enough to stay in both for a few days. On arrival, we were shown to our “Tree Lodge”. This place makes Sylvanian Families (shoutout to my Brits) look average. We settled in to our treehouse which is the stuff of dreams. Towering thatch and stick ceiling, a panoramic view of the treetops and an outdoor shower brought together with our own African Safari picnic (Amarula, Wine and Ice). They also have a natural bath that I just loved. Once in, we were asked which our favourite drink was and given our safari schedule with our own Indiana Jones, Warick. That afternoon, I had my first (of 5) real safari experiences. While I would love to write something witty here, perhaps about Animal Print or the like, I have to be accurate in my depiction. It was the most impressive natural sight I have ever seen. The first day, we saw ALL of the big 5. Not from a roadside, not through binoculars, but up close, touching distance. Suffice it to say that I am not exactly the outdoorsy type, but I cannot measurably convey the variety of animals and how close we were to them. 16 lions, 25 something elephants, a plethora of Giraffe, Rhinos, Leopard Cubs, a Cheetah, a pack of 14 Wild Dogs regrouping after 2 months (a big deal in SA), Buffalo, Hyenas and of course… Impala. How is this possible? Well, unlike some of the other reserves, this is a conservation which allows the guides (Guardians) to go into the bush to track them where other parks have to stick to the roadside only. We tracked lions and drove right up to them… Like RIGHT up to them. They were touching distance (they would have been If I wasn’t fearful of losing a limb). At sunset, we were taken on a “slight detour” back… As a surprise, they had organised a “Bush Dinner”. They had set up the most incredible rural banquet table with a ready roaring barbecue and.. you guessed it… all of our favourite drinks and wines. Now when I say “Bush Dinner”, I mean like literallyin the middle of lion and leopard safari territory… Like, cutlery here, Elephant there. If anyone is getting eaten, I knew I’d be easy pickings so I won’t pretend that I didn’t purposely put our guide “lion side” at the end of the table. Because, when it gets dark in the Bush… It gets DARK. The food was (genuinely and consistently) incredible thanks to chef Enny and her team. We had Ox Tail, We had chicken, we had pork, we had freshly fire baked patta-patta bread, we had chocolate tarts. I mean, we ate well. That applies to our whole stay. 4 feedings a day of truly beautiful food without all of the pomp and circumstance of a city hotel or “theme park” safari. The downside of such a remote sanctuary is that wifi is almost non-existent. Even with a dozen boosters and connectors, I was unable to get any 4g or wifi at all. “That’s fine! You’re on Safari, not browsing Safari!” (I am tm-ing that one)… which is all well and good until you can’ check into a flight, or be reached at all, or contact your next hotel with delays etc. That said, I am told that this is being worked on and for me at least, it was really refreshing not to be able to check my emails and insta every 2 minutes and actually watch a sunset rather than post it. At 4:45am on our second morning we met Jaci. She was everything I hoped she would be. A well-travelled woman who had decided that this was her dream spot to open a hotel. She absolutely looked the part in stylish Khaki and even had two dogs (which obviously I loved). After this, we headed back on another Game drive. Say what you will, but I’ve never had a coffee morning like one there. This was all perfectly rounded with an in room massage. I mean… I thought that The Tree-lodge was unbeatable out here. It is, but I have found something that absolutely equals it. This place is straight out of a Safari Novel. Bedouin tent sides and a direct view of the reserve with a veranda into the bush. My first morning, I awoke to two monkeys falling from the tree onto our veranda, play-fighting (which was big enough to have a cocktail party). The best thing (other than the impeccable design and look of the Safari Lodge), is… You have your very own Starbed. Did I sleep in it? No. Will I pretend that I did? Absolutely. Truth be told, were it not for my innate fear of all things bug, I would have. However, after my previous Jumanji wasp encounter and the thought of meeting one of the “totally friendly” spiders I had heard about was enough to put me off. Sure, I got in after 4 glasses of wine for some pics, but there was no way I was bedding down with anything with more than 2 legs. 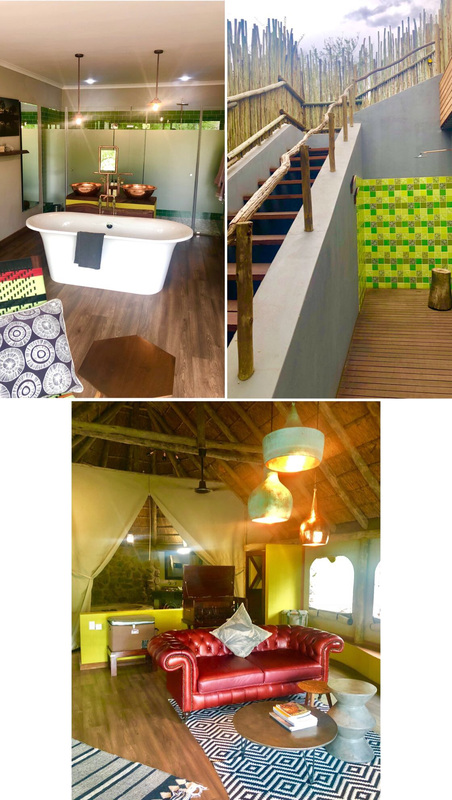 From my very much indoor bed, I can tell you that it had all of the design features (including 4 different showers incase you fancied a choice) but always in keeping with that Safari influence. Sustainability and tonnes of Eco-Friendly Initiatives (anti plastic, conservation, water saving and anti rhino poaching campaigns). One of the things I love about this place is that they are all about Conservation, Environmentalism and sustainability. They even provide each guest with a water bottle to keep to reduce plastic use. I am using mine as I write this. Its the small things that make this place special. Sundowner drinks in the bush every night. Remembering your favourite things and having them ready for you. Knowing everyones name by heart around the property. I arrived as a city girl with zero experience of lion taming and leopard tracking… I have left as a city girl with zero experience of lion taming and leopard tracking, but maybe just a little more safari in my heart. I’ll meet you by the watering hole.